Parody is one of the highest forms of flattery, and in many cases, it means something has left a subculture and entered the mainstream. Such was the case when The Official Preppy Handbook became a bestseller and suddenly preppy went from the confines of northeastern prep schools to Middle America, thanks in large part to clothing brands like J. Crew and Ralph Lauren. There have already been a handful of great books documenting the preppy look and subculture in the past (Take Ivy, the 1965 Japanese published book that documented Ivy League style, was recently re-published by powerHouse Books, it is the best of the lot), but now that preppy is back in vogue, Jeffrey Banks and Doria De La Chapelle have put together a beautiful photo history with Preppy: Cultivating Ivy Style (Rizzoli). I grew up hating preppies. I also grew up in a neighborhood labeled by The Official Preppy Handbook as one of the preppiest cities in America (it was also referenced by Stephen King in Pet Cemetery two years later, so I guess that cancels it out). By the time I was ten, A.C. Slater was calling Zack Morris “Preppy,” and the term began its reversal into something you said with disdain. As far as I can tell, there was never a preppy revolution, making it different from hippies or punks. In the pantheon of high school assholes, preppies were up with jocks and PE teachers at the top. Now that I’m older, I appreciate preppies more. I’m not sure what changed. Maybe I’ve seen films like Rushmore and Metropolitan so many times that I’ve come to identify with the characters, and I’m jealous of their nice clothes and preoccupation with trivial things. 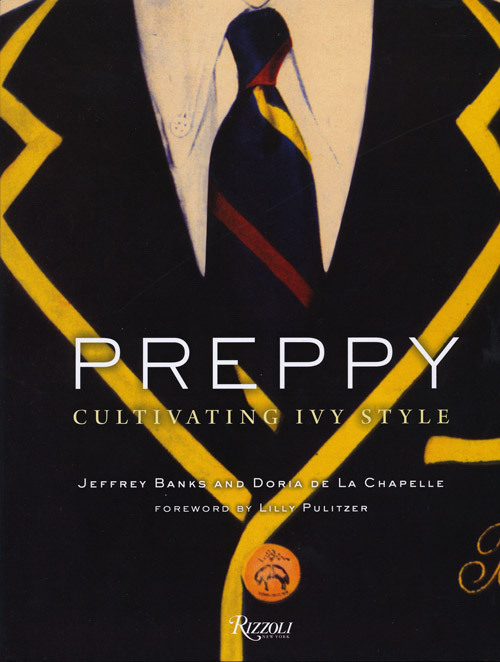 Either way, I don’t see the preppy book genre going much further at this point, but Preppy: Cultivating Ivy Style is a gorgeous way for it to fade out.